Things have never been better in the good ol’ U.S. of A. Post-war prosperity has made it possible for families to carve out quiet lives in the suburbs, we’re all in love with Lucy (what will she get into next? ), and President Eisenhower is doing a swell job. Heck, if that new Bill Haley song is to be believed, America will be “rockin’ around the clock” for another 60 years! But even with all that Wonder Bread-infused goodness, one problem still plagues our great nation: women who don’t know how to deal with their hubbies during football season. Seriously, gals, would it kill you to let your man enjoy the game in peace? What does he have to do to get you out of his hair for three hours—storm the beach at Normandy again? 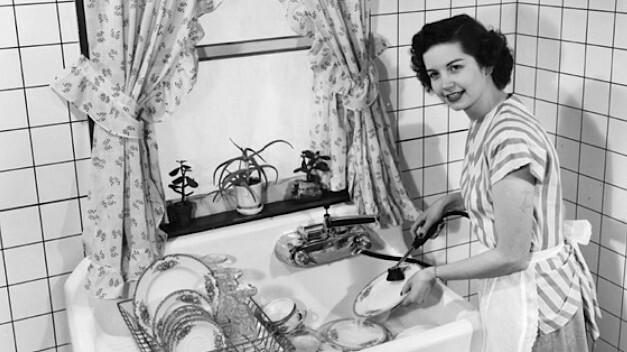 So put down the dishes and put on your best set of house pearls, ladies. Milwaukee’s TMJ4 and an out-of-town “relationship expert” are here for you. So here you go, ladies—some sound relationship advice (from an expert being interviewed at Ma Fischer’s, no less!) that guarantees your lantern-jawed, post-war man will remain happy, entertained, and nag-free. Check out all three (!) segments below, commit them to memory (but don’t even try to understand “fantasy football”), and don’t forget about that casserole in the oven. The quickest way to a man’s heart is still through his stomach; the second-quickest way, of course, is by not understanding football.